Founded in 2013, Études arméniennes contemporaines is a bi-annual academic journal that examines contemporary issues directly and indirectly related to Armenia. Published in French and in English, the journal is multidisciplinary, and welcomes contributions from researchers from all the social sciences. It is especially interested in studies at the intersection of geography, history, politics, and culture in Armenia, the Caucasus, Turkey, and the Middle East. It also addresses thematic questions such as international relations, nationalism, diasporas, migrations, memory and patrimony, genocide studies and mass violence. 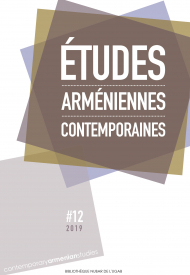 Études arméniennes contemporaines is the first journal in the field of Armenian studies to be published simultaneously in electronic and print editions. Ce 12e numéro d’Études arméniennes contemporaines contribue à l’histoire du génocide des Arméniens, à travers l’étude de la spoliation des biens mobiliers des déportés et celle de la turquification des orphelins arméniens. À noter également un détour sociologique par le quotidien des Arméniens d’Istanbul, confrontés au déni ordinaire, et l’exhumation des relations entre activistes arméniens et militants pro-SDN au lendemain de la Grande Guerre. This 12th issue of Études arméniennes contemporaines contributes to the history of the Armenian genocide through the study of the plundering of the movable properties of deportees and of the Turkification of Armenian orphans. Also noteworthy is a sociological detour into the daily experience of Istanbul Armenians, confronted with ordinary denial, and the excavation of relations between Armenian activists and pro-League of Nations militants in the aftermath of the Great War. New York, Oxford : Berghahn Books, 2017, ix-208 p.
Beyrouth, Presses de l’Université Saint-Joseph, 2017, 511 p., ill.
Londres et New York, Routledge, 2019, 304 p.